Play It Say It welcome New York artist David Berrie for a first EP on the label and one that offers three dynamite pieces of punchy, high impact and inventive house music. Raised amongst the diverse culture of NYC’s nightlife, Berrie started sneaking into clubs as a youngster and since then has risen through the ranks to have now played iconic rooms like Output NY and DC-10 Ibiza. Fusing his musical history with other genres to create his own, unique style of house and techno, David has taken his passion to the studio and served up essential tunes on Hot Creation and Cuttin’ Headz. 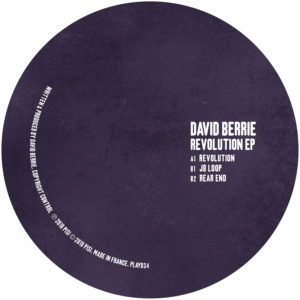 Opening the account is ‘Revolution’, seven superbly programmed minutes of slick and involving house beats and knotted bass. It’s a restless, body shaking track to make the floor move with futuristic synths fleshing it out and bringing a vital sense of machine soul. The equally compelling ‘JB Loop’ is another dynamic bit of electronic house music. Rubbery drums bobble and bounce about with wild computer sounds and infectious bass all ramping up the energy levels and making for a standout track. Last but not least, ‘Rear End’ is a supple, intricately designed track with slippery synths, spinning hi hats and bass surges all wrapping around each other to make for real minimal funk. It’s a track that oozes Detroit vibes and cannot fail to sweep up the floor. These are three characterful and masterfully produced cuts of high-class dancing music.